"A Luxembourg newspaper is reporting that Olympic time trial champion Fabian Cancellara will follow the Schleck brothers to a new team backed by still unannounced sponsors". "Cancellara is just the latest big name to join Frank and Andy Schleck in the move to the new Luxembourg team. Others expected to join the Schleck brothers include Stuart O’Grady, Jens Voigt, [Anders Lund], and Jakob Fuglsang. Ex-Saxo Bank sport director Kim Andersen and former CSC team spokesman Brian Nygaard are organizing the new team with a yet unnamed sponsor". *Post post update (09/23/10): The Luxembourg Team picks up Daniele Bennati who has signed a 2-year contract. 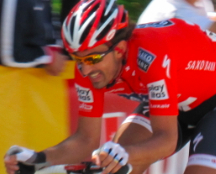 Fabian Cancellara has not yet confirmed his new team contract for 2011. He boarded a plane yesterday en route to Australia where he will focus on the UCI World Road Championship race, rightly giving the attention to his current team Saxo-Bank.